My dog is terrified of water. I use dry shampoo to keep her clean. 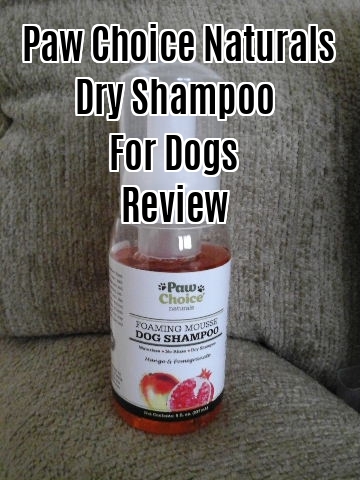 This is my review of Paw Choice Naturals Mango and Pomegranate Foaming Mousse Dry Shampoo. In my review, I’ll let you know if it stands up to a regular bath. Let’s start with a definition of what this is. Dry shampoo is sometimes called waterless. The reason is that you do not need to rinse it off with water. Some can be left in to dry while others need to be wiped off with a towel. I’ve used Furminator for years. It originally came with a pleasant coconut scent and it worked great. Over the last few months I’ve noticed that it hasn’t been working as well. It may be that the product ingredients have changed or my dog’s skin type is different now that she is 7. Whatever the case, I wasn’t pleased with the results. I wanted something that was easy to use. The fewer steps the better with my fussy dog. I wanted something that would leave my dog as clean as if she had a normal bath with water. Many dry, waterless dog shampoos tout themselves as “in between baths” not as a replacement for baths. They are only good at freshening up your dog, but they don’t give them a thorough cleaning. I want it to be good for my dog’s skin. No irritants and no reactions, please! I read several reviews. After comparing reviews, ingredients, and instructions, I decided on Paw Choice Naturals. Most dry waterless shampoos come in spray form which really is not helpful. Most dogs have an aversion of spray bottles, which probably starts when someone uses a squirt gun or spray bottle as a training deterrent. Though I never used those methods on Misha, she does not like spray bottles. This brand comes as a foamy mousse. You squirt it into your hand. Then, you massage it into your dog’s coat until it is evenly spread. That’s it. It does not have to be toweled off or rinsed. First off, let’s talk about the bottle. I really like the pump. It’s much more like a liquid soap pump than a spray bottle. I have arthritis in my hands and most spray bottles are difficult for me to do. This pump is easy to work. I found that it is easier to pump the mousse into a small cup instead of my hand. The reason being my dog is afraid of the foam. I know. Only Misha would be afraid of foam. 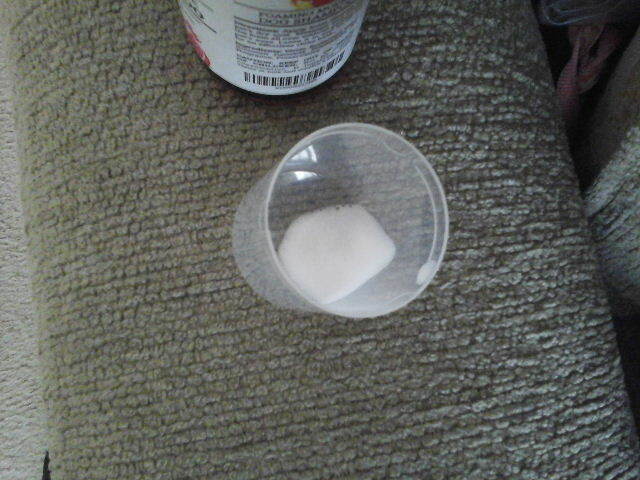 I find if I pump it into a cup, I can get as much as I need while keeping her from fleeing. If I’m pumping into my hand, I have to keep reaching for the bottle which only complicates things. It goes on easily. The foam disappears almost instantly. I found that her fur feels a bit like my hair does when I use leave in conditioner. It’s a bit sticky to the touch at first. 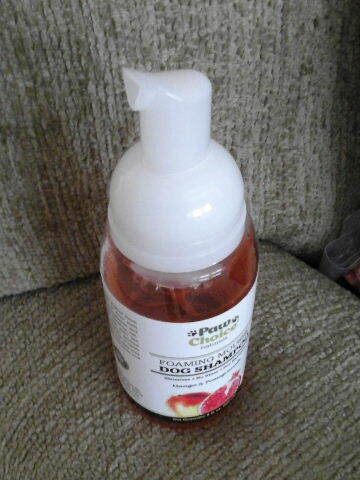 My dog was very clean after a bath with this product. Her fur is white and it did not look dirty when she dried. Her fur feels good to the touch. There is no sticky residue once it dries. Her fur is soft. I don’t see any dirt specks at the skin level or on her fur. 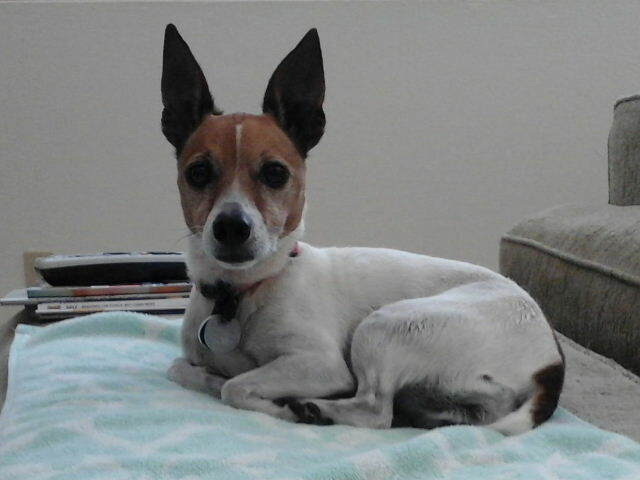 My dog is small, about 7 lbs. I’ve bathed her 4 times. It does not seem like I have used very much even though it seems like I’ve pumped quite a bit out of the 11 ounce bottle. I imagine I will get several more baths out of this one bottle. When I used liquid waterless spray shampoos, I usually only got 3-4 baths out of one 16 ounce bottle. My only complaint is the scent. I found the mango pomegranate scent overpowering. I am the type of person that prefers unscented products. It takes a couple of days to wear off. I preferred Furminator’s original coconut scent to this perfumy fragrance. In summation, I love the way it worked. If my dog wasn’t afraid of the foam, it would be very easy to apply. The fact that it doesn’t have to be dried off with a towel makes it easier on both me and my dog. I used to have to pick her up and hold her so I could get the shampoo on and towel it off. I can do this while she is standing on the ground provided I keep her on leash. That’s less traumatizing for her, I think. My dog looked and felt clean after an application. However, the scent is a bit much. It could be toned down some. Overall, I am pleased with the results. Now if I can get Misha to get over her fear of the foam, I’d be very happy! She loves a good massage, so I have high hopes that she’ll eventually come around. What a great idea, I would never have thought that there would be such a product….Glad to hear there is though. This sounds like a wonderful product when you can’t bathe a dog the regular way. I wonder if this would work on cats who hate baths.